Sometimes you just want to add a little something to your Kitchen to change it up a bit! Nothing extensive or expensive… so today we have a collection of Charming and Inexpensive Farmhouse Kitchen Updates. The Holidays are going to be here before you know it so why not do a few of these little things for you and your Kitchen. It can be as simple as getting a set of new Dish Towels… or how about a new Light Fixture… a pretty Tablecloth would be wonderful too. What a bout adding Wallpaper to the back of your cabinets… or a new set of Curtains. Maybe add some Thrift Store Finds to a basket or a hanging rack… just a little something : ) You will find some really helpful ideas below. Which one would you pick if you could only do one? Would love to know… knowing more about YOU helps me put together better posts for you. Now grab your favorite cup of brew… pick up a little snack and head to that comfy chair… put those feet up and be inspired! Bre has a fabulous Wall Plate Rack in her beautiful Kitchen and it adds so much to the space. It is a place to display special dishes and other special pieces like Silver Trays… Cutting Boards… Artwork… Greenery… Accessories… Glasses and more. It’s like curating a piece of Farmhouse Artwork. The best thing is is that you can change it up any time you want. It’s a “forever” piece that just keeps giving! Do you have a space in your kitchen where you can put a few extra shelves? Then maybe you should visit Ella Claire Inspired and check out her gorgeous and OH so useful DIY Kitchen Jar Shelves. Not only does this add character and charm to your Kitchen Space but it sure makes things easier when you are cooking and baking. Everything is in sight and reach. Love everything about this. Do you have a space on your counter that is empty (I’m laughing to myself because I don’t : ) but if you do… Yvonne has a great idea for you. Create a little Coffee Station. It doesn’t take a lot… make a fun rack on the wall to hold your favorite mugs…a pretty tray that will hold the sugar… creamer and other essentials… of course the Coffee Maker and how about a fun Coffee Sign! Come on over to StoneGable for more inspiration. Just let your imagination blossom and you will come up with the perfect space… probably just by shopping your home. You can update your counter in a snap! How about adding a collection of cutting boards and some greenery… instant charm and cheer! Well I have some more good news for you… Liz over at Love Grows Wild is sharing 11 more great ideas on how to update your counter… check them all out… I know one will be perfect for you. Do you know what would change the look of the whole kitchen in an afternoon? Changing up the Hardware on your cabinets! It is totally amazing how much of a difference it makes. Apartment Therapy is sharing some fabulous ideas. Just think of the possibilities… from brushed silver to brass the hardware possibilities are endless. What would Joanna Gaines do? Well how about this simple… budget friendly little projects. Add a few Hook Bars to the wall and display some of your pans! Stack a few cookbooks up… add a plant and voila… a whole new space in almost no time. How about adding some greenery! Plants warm up a room… there is just something about them. So how about adding them to your shelves… counters… window sills or tables in the Kitchen… they will add so much charm and warmth to the space. If you have a black thumb… there are tons of fabulous faux plants out there… so that is no excuse : ) Drop by Magnolia for more inspiration. How about adding some open shelving to your Kitchen? 1… 2… 3 shelves or more… it all depends on what kind of space you have. There is just so many different things you can do with open shelving. Display your fabulous finds… house some plants… canisters… tins… glassware… bottles… wine… coffee mugs… dishwater and so much more. Thanks for the inspiration Decoholic! Laura over at Little Yellow Wheelbarrow has an amazing DIY Pot Rack for you that will make your Kitchen SMILE! A Big Farmhouse Smile for sure. It’s a great weekend project and she is sharing the full DIY and plans. What you will have when you are finished is a gorgeous forever piece that will display all of your pots.. pans… and more. Once again… I love additions to the Kitchen that not only look great but save space and serve such a useful purpose. I had to include this pin… it did not lead back to a direct source : ( but it is such a great idea! 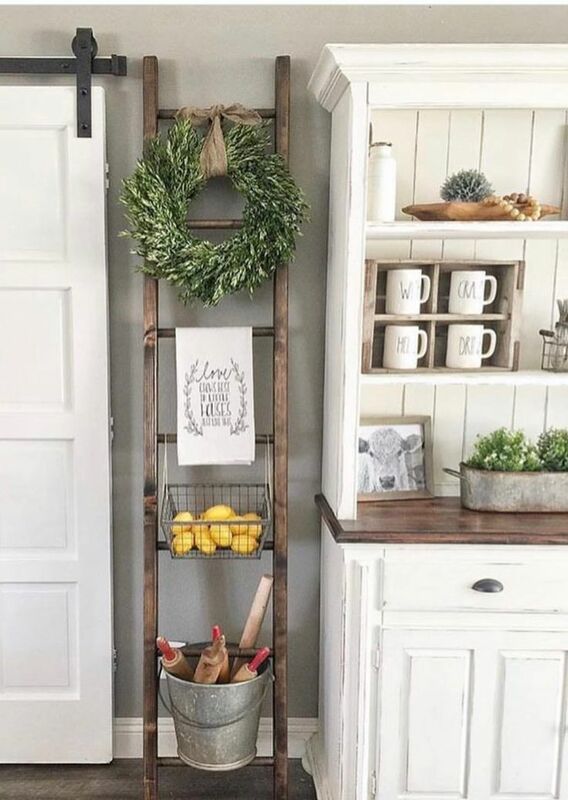 Add a ladder to your kitchen… hang a wreath… hang your favorite towels… oven mitts … add a basket or two… maybe a shelf to one of the rungs! Looks amazing! Just either make a straight ladder or head out to your local hardware store. You could paint it…stain it… give it a distressed treatment or leave it raw. If you have a more minimalistic Modern Farmhouse Style… adding one of these DIY Wire Utensil Racks just might be a perfect addition over the store or on another wall space. The tutorial is waiting for you and it is very straight forward and the supplies are budget friendly for sure. Just think how you can stylize this one … looks great and organizes… gotta love it! Check out the entire Kitchen over at A Beautiful Mess. Now for a super quick and easy Kitchen pick-me-up…do what Miss Mustardseed did… purchase a new rug. You can go neutral or maybe you want to add a little pop with color and a pattern. No matter what you choose it will definitely brighten your space quickly. Sometimes a fresh coat of paint on your cabinets will change the entire room and then if you add new hardware… well need I say more! Come and see how Lauren over at Bless’er House gave her kitchen a total refresh… tons of ideas await you. The girls over at A Beautiful Mess have a great DIY for a Modern Farmhouse Vertical Kitchen Organizer and wow does it look wonderful. Not only will it hold your utensils but you can add some fresh blooms or even fresh planted herbs. Looking for some more Kitchen Ideas and Inspiration…check out our Kitchen Gallery! « Free Printable 2019 Justice League One Page Calendar /// With Superman, Wonder Woman, Batman and more!